Monarch butterflies are particularly fascinating and inspirational symbols of strength, miraculous spiritual guidance, and perseverance. Every year, the 4th generation of one particular breed travels up to 2,500 miles, about 100 miles a day, from Canada and Northern parts of the United States to the same location where their ancestors went before in Mexico, using only their internal GPS. If such small creatures can find and follow their purposeful path, so can each of us with the appropriate tools and support. The following article from the Monarch Butterfly website also explains their adventure, strength, and determination that can teach us to pursue our goals, trust our innate instincts, never ever give up, appreciate the beauty around us, and keep the faith that there is a path and purpose for us all. The monarch butterflies will spend their winter hibernation in Mexico and some parts of Southern California where it is warm all year long. If the monarch lives in the Eastern states, usually east of the Rocky Mountains, it will migrate to Mexico and hibernate in oyamel fir trees. If the monarch butterfly lives west of the Rocky Mountains, then it will hibernate in and around Pacific Grove, California in eucalyptus trees. Monarch butterflies use the very same trees each and every year when they migrate, which seems odd because they aren’t the same butterflies that were there last year. These are the new fourth generation of monarch butterflies, so how do they know which trees are the right ones to hibernate in? Monarch butterflies are the only insect that migrates to a warmer climate that is 2,500 miles away each year. The Monarch butterfly migrates for 2 reasons. They can not withstand freezing weather in the northern and central continental climates in the winter. Also, the larval food plants do not grow in their winter overwintering sites, so the spring generation must fly back north to places where the plants are plentiful. Would you like to help track monarch butterfly migrations? Visit Monarchwatchfor lots of information on tracking migrations with a color map. The monarch overwintering sites are under threat because of people cutting down their favorite trees to build roads, houses and farms. What will happen to the monarchs if they do not have their special trees to spend the winter? There are groups that collect money to save the important trees and educate people about monarch conservation. You can learn more about helping monarchs here. 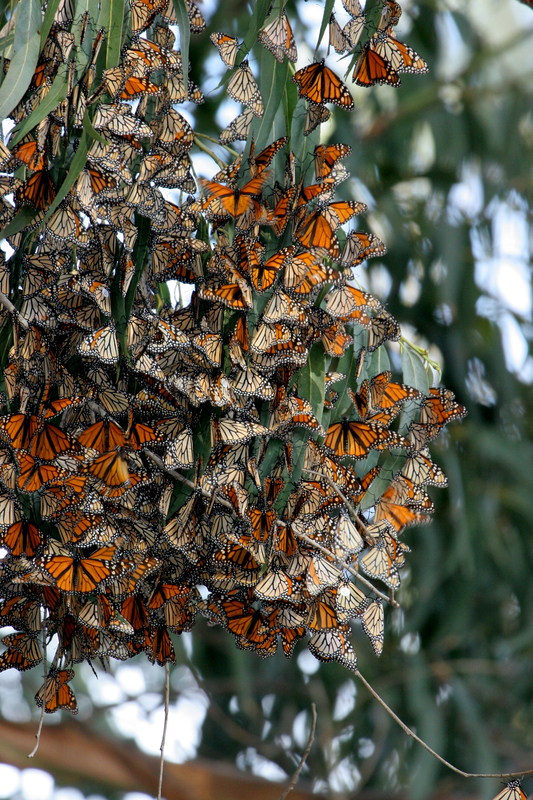 Thank you to the Monarch Butterfly website for the article “The Migration of the Monarch Butterfly” and other fascinating information and photos of these creatures: http://www.Monarch-Butterfly.com.